I know that memories fade over time, especially after forty years, but even then they leave impressions. My impression of the Kulu Manali valley from forty years ago is one of a quiet and remote valley system, the couple of small towns which give it it’s name, and a valley which didn’t lead anywhere but to itself; famous along the 70’s hippy trail for the quality of it’s hashish (still is come to that – and you can see why they call it “weed”, it is growing everywhere – bit like lantana in Queensland!). Of course, even then, the road went through Manali and continued up over the Rotang Pass (nearly 4000 metres) and on into Lahul and Spiti and so to the high altitudes of Ladakh. But we weren’t allowed to go there without special permission. Not strictly true – forty years ago (just as we were there) Ladakh was opened for the first time to western visitors, but at that time we didn’t really have the means to go. 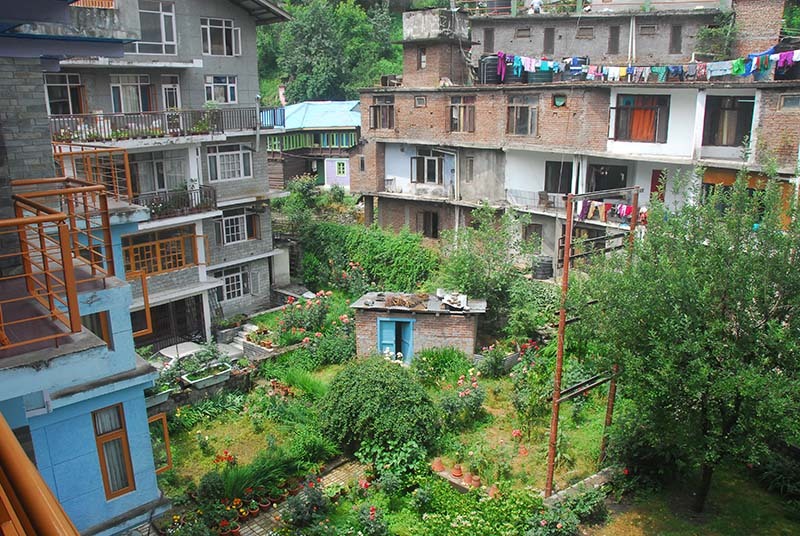 Modern day Manali is not at all like that. We decide to take a taxi from Macloud Ganj and we find ourselves in the pouring rain setting off initially through the Kangra valley. For the first time, there is water in the rivers, brown with sediments; the soil being washed away. We are travelling from west to east and so the fingers of the foothills mean crossing a river, a winding road up over hills, we hang on as we are thrown from side to side, down the other side and across another river; this repeated endlessly for the first three hours. We take a quick lunch stop at a roadside cafe and eat a delicious meal of rice, dal, chickpeas and chapattis then back on the road. Following the rain in Manali, the mountains appear. We have now arrived at Mandi, a sprawling town on the river Beas, and where we take a sharp turn to the north to start our journey into the Kulu Manali Valley. There is a lot of traffic in both directions following the road which is running right next to the river. At times there are old landslides, now roughly fixed – a reminder to us that the monsoon is not far away. Then the dam. I don’t remember a dam here, but there is one now, catching a huge volume of water behind it’s walls and creating a spectacular gorge. The road is now literally cut from the side of the cliff – the drop down to the water is sheer. Then the tunnel. I definitely don’t remember a tunnel especially one three kilometres long. The lighting in the tunnel is very sparse and there is a continuous stream of approaching headlights, but the driver doesn’t seem to mind too much and soon we are through and the last stretch of the dam is replaced by the roaring river once more. It hasn’t been raining here yet, so the water is not brown, but clear where not white water. Kulu arrives amid the hooting of horns and a traffic jam caused by a collision between a bus and a car accompanied by a huge crowd of lookers on. Once through the jam and the sprawl of Kulu the white water rafting businesses start with drop in and pick up points at regular intervals with large numbers of tents set up presumably for customers. Amongst all this are the fruit stalls; boxes of apricots, cherries, peaches, apples and others sit in the fumes of the traffic. No shortage of customers though; cars stop and families pour out to buy the wares. On the other side, endless Kulu shawl factories, cooperatives, outlets, special shops, fixed price shops line the road. The traffic gets heavier as the road surface deteriorates, at times bumping over potholes and badly repaired stretches where earth slips have occurred. Nearly in Manali now and the traffic comes to an almost complete halt. 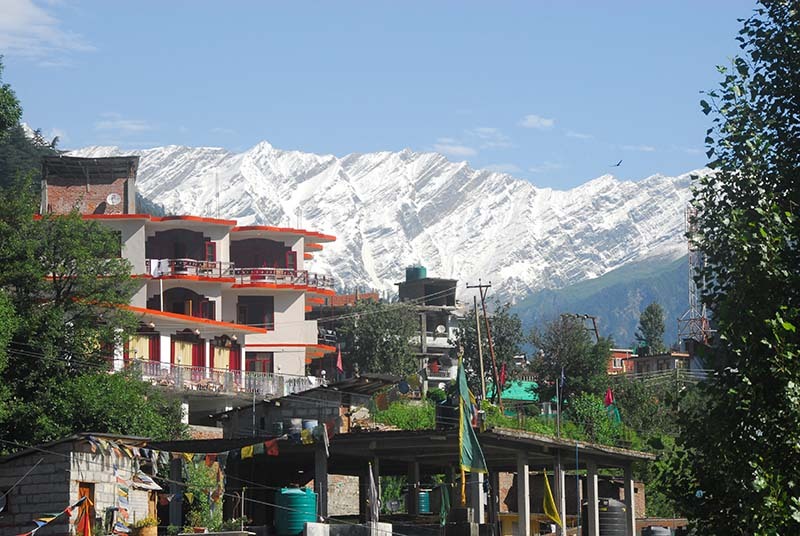 As we approach the town, two interesting features of Manali become apparent. The first is that apart from the main road, no roads or streets have names. Our hotel gives it’s address as “Model Town”. The second is that, a couple of years ago the planners in their wisdom closed off a five hundred metre stretch of the main road through town, known as the Mall, to make it just that, a pedestrian Mall – great for the pedestrians but hell for the endless queue of cars, buses and trucks that have to find alternative routes. This has resulted in an almost permanent traffic jam – on one evening there is complete gridlock and most of the vehicles have simply turned off their engines and are just sitting there waiting for something to happen. Even the hooting is subdued. Our taxi driver begins the quest for the hotel, asking policemen and passers by where it is. At one point (where we are about one hundred metres from our hotel we know later) a policeman stops the taxi from going down the road which would get us there and sends us off around a two kilometre circle which includes crossing the river twice on two different bridges to get back to a point which is almost where we started from. We are near the Tibetan Monestary and at last someone knows! They jump into the spare seat in the taxi and guide us to the door of our hotel, amid cheers from us, some eight hours after we started our journey. We are exhausted! 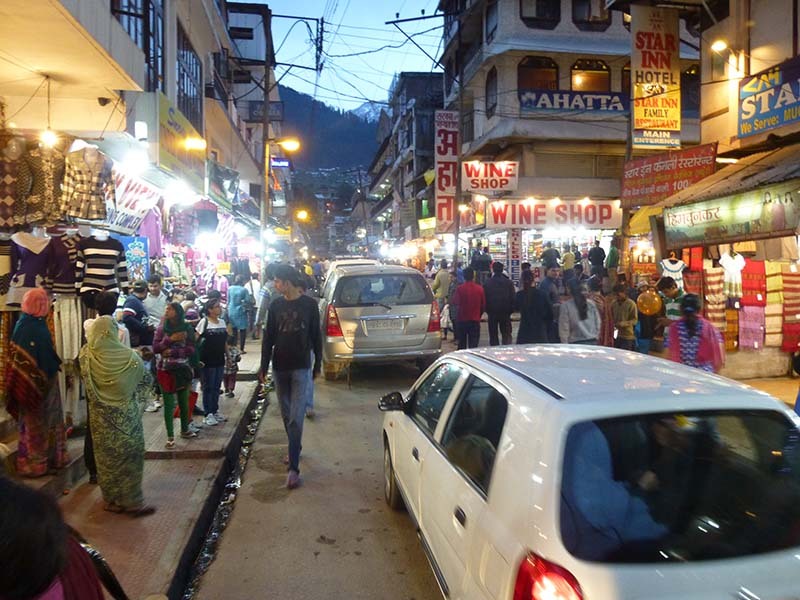 Manali is above all an Indian holiday town where visitors can escape the “just before monsoon” heat of the plains and they flock here in their thousands. 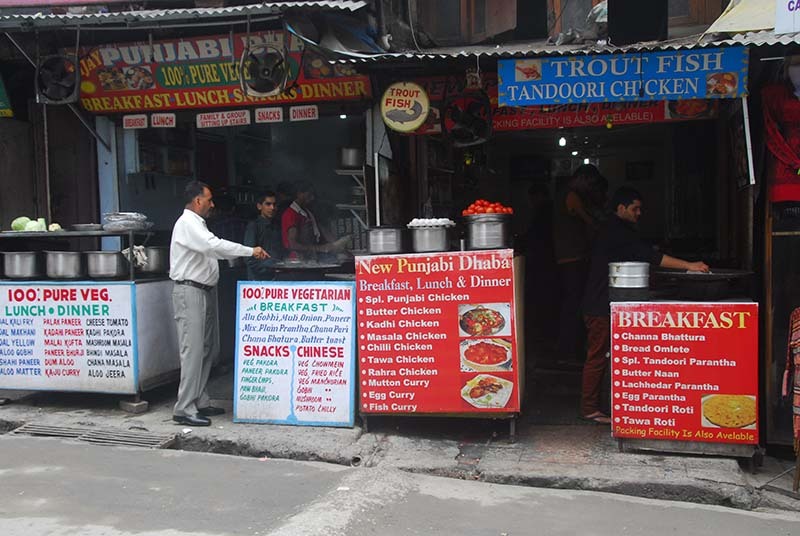 We venture out to find somewhere to eat and just around the corner come into a street lined with shops and punjabi dhabas, the traditional cafes of the Punjab. We go into the first one, 100% Pure Veg it proclames, and order Thali, the traditional meal-on-a-tin-plate with rice, dal, two veg curries, curd, pickles and as many chapatis as you can eat, washed down with sweet tea and mango lassi. Yum! Thus fortified it is time to explore a little and so up to the Mall we go. What a scene! The Mall is about 30 metres wide and 500 metres long and is totally packed with people enjoying the early evening cool. Everyone, especially the Indian women, is dressed to the nines (as my mum would say) – hansom sikh men in their brightly coloured turbans; other men smartly dressed and clean cut; many of the women looking like princesses in their gowns of many colours- the Indian middle class in all their finery. 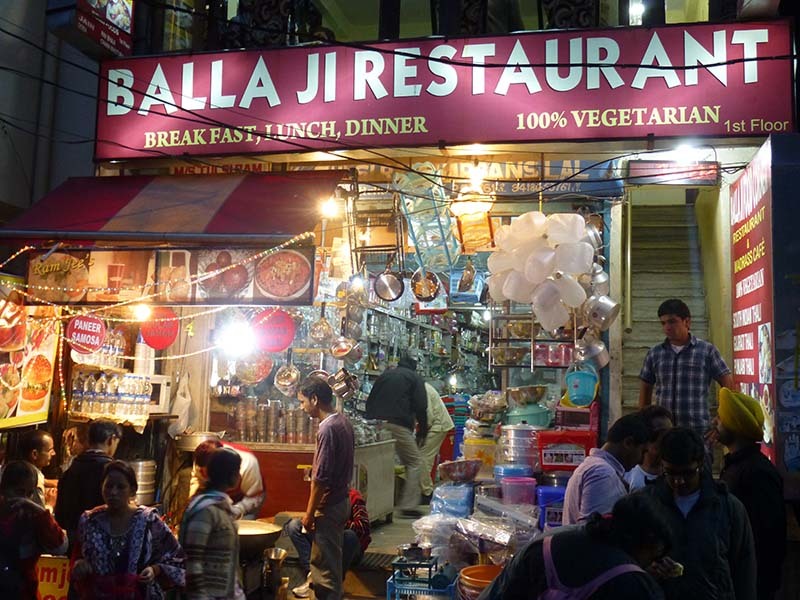 Large family groups wander from brightly lit shop to brightly lit shop or stand around the many finger food stalls selling samosas, potato pancakes, sweets and fudges, cakes and other strange things which we cannot identify. 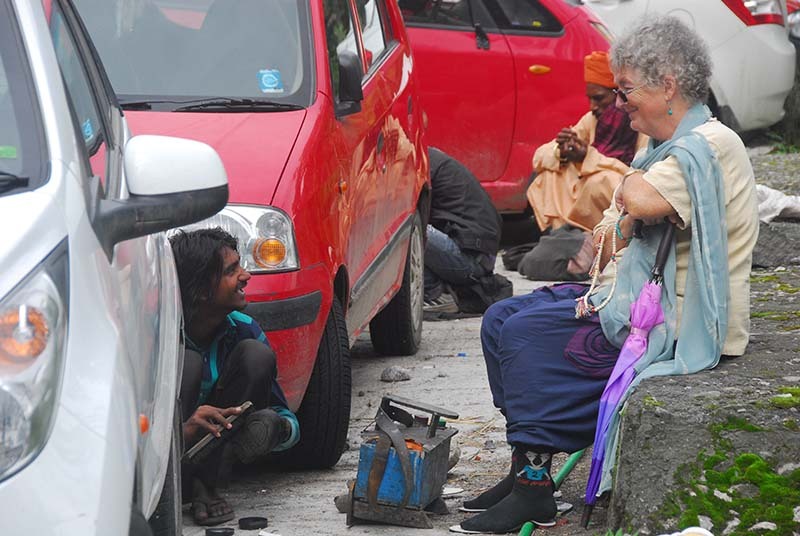 Hawkers tout their wares: foot massage; ostrich puppets on strings; bags of pink of candy floss; shoe shine and repair; balloons and of course the beggars looking for their supper. It is so crowded it is difficult to walk in a straight line and soon we give up and return to the hotel for our first nights sleep. This is certainly not how I remember Manali! 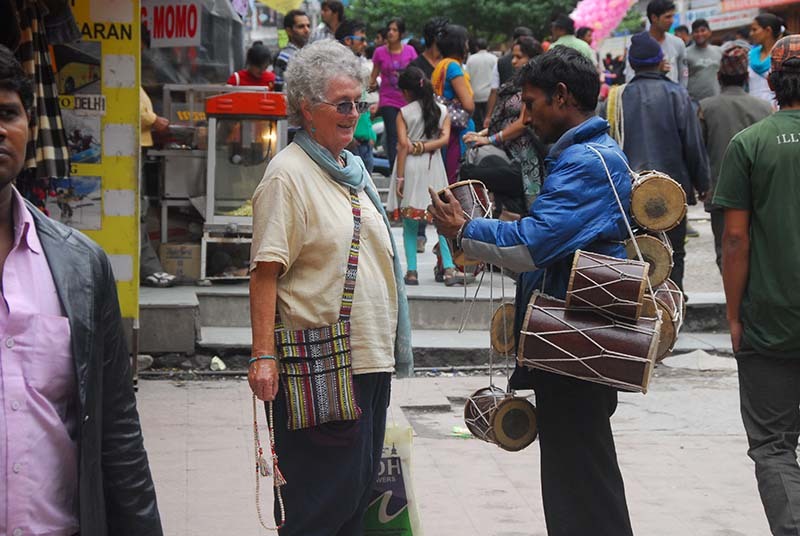 You’re really trying to sell ME a drum – you must be joking! And so to our fortunate meeting. The Silmog Garden hotel has WiFi, the essential accompaniment to the modern traveller, but only in the hotel reception area. This is a bit of a shock since we are used to having access in our room – how we so easily take things for granted! We are expecting to meet Pippa on her way through Manali to Ladakh. We haven’t heard anything from her for a while and just as we were getting a tiny bit anxious we get a message via Facebook that she is here. We are off to seek her out in Old Manali which is where most western travellers end up to avoid the chaos of New Manali. A tuk-tuk drops us off and we find our way along a narrow path through orchards and vegetable gardens to the Up Country Lodge and there she is! She is looking and feeling really well. We have been on touch with her during both our journeys, but it is wonderful to see her in the flesh and after our initial hugs we are all off to get lunch and continue chatting. 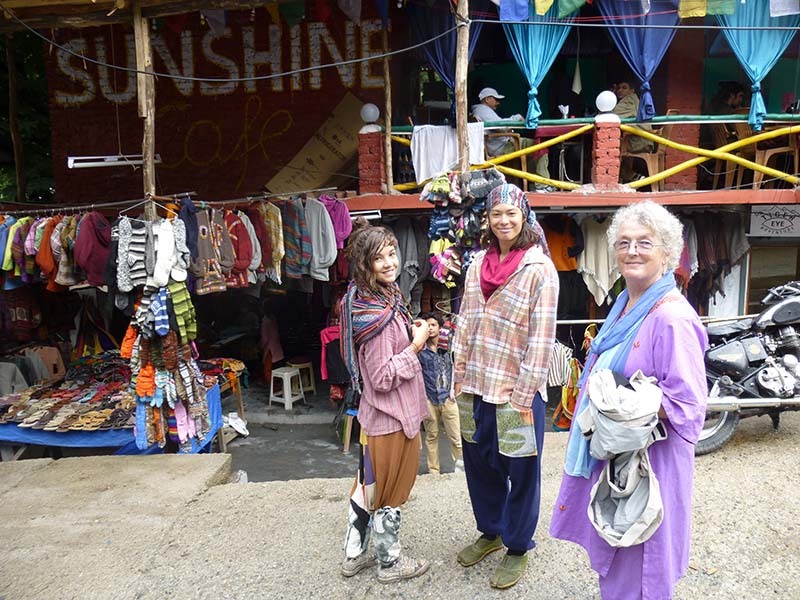 She is travelling with her girlfriend, Tara, and they have been joined by Laurie, a french women who has been travelling for six months now. 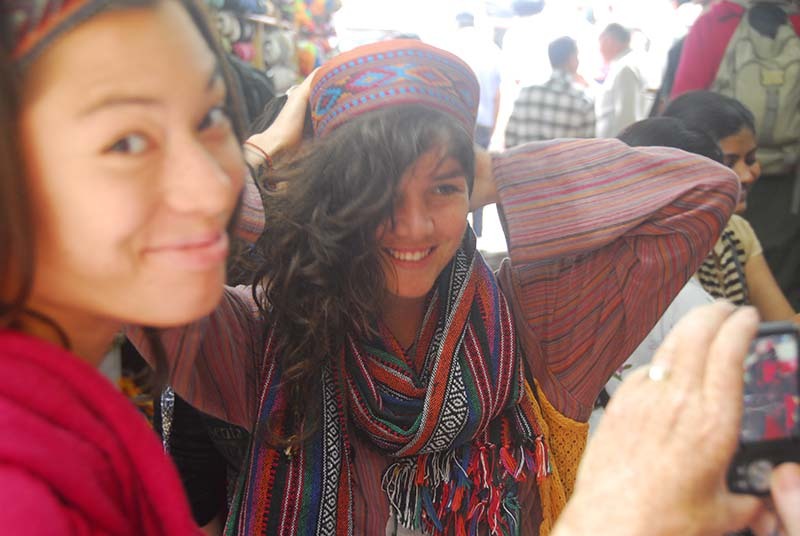 We sit in a tibetan restaurant eating veggie noodle soup and spend the next couple of hours catching up. Wonderful! They will stay here for the next three days and take a rest before the two day bus ride to Leh in Ladakh. 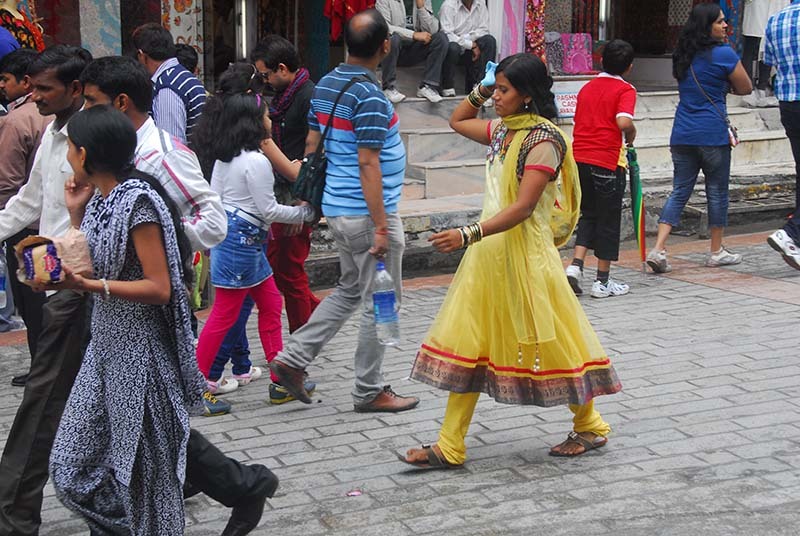 We will see lots of them during this time with both us coming up to Old Manali and them coming down to New Manali. It is time for us to return to the hotel and so we set off to walk, knowing that there is not much point in joining the evening traffic jam. 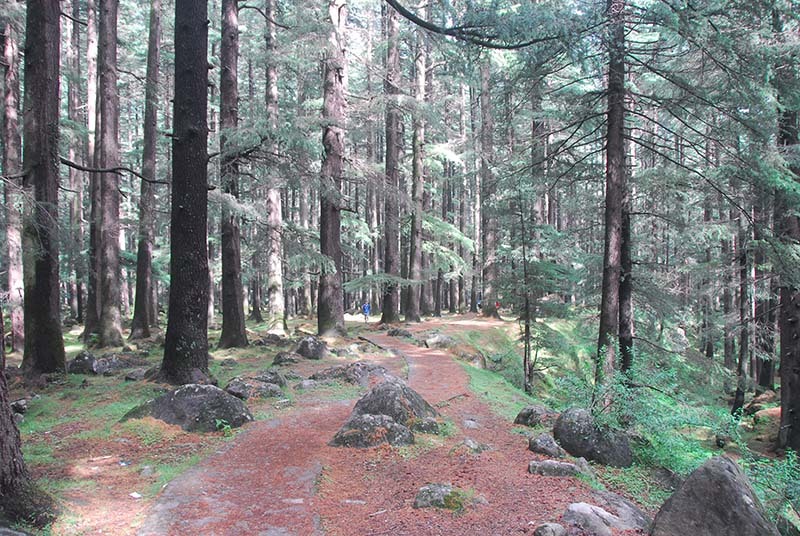 Crossing the bridge we find the entrance to the Nature Park and for the R5 entrance fee (10c) we are walking along the path through beautiful, old growth deodar forrest (a variety of conifer) all the way back down to the chaos of New Manali. Definitly one of the highlights! 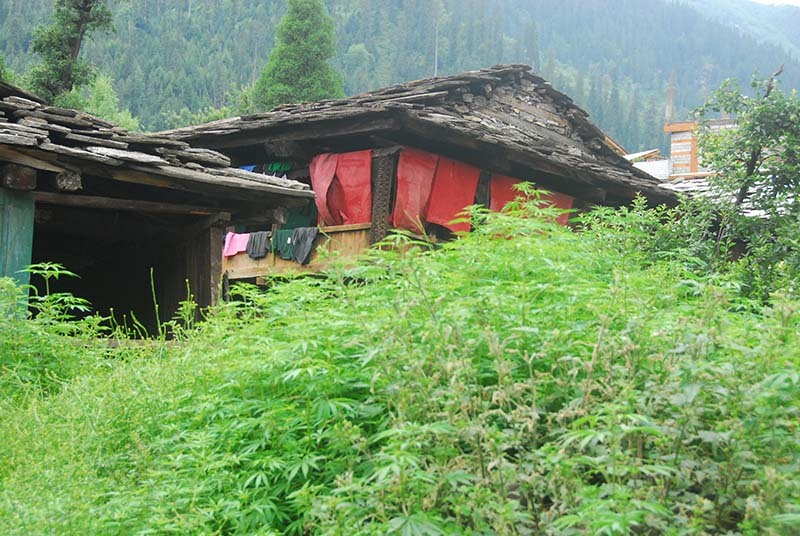 There is not really much to Manali when it comes down to it. 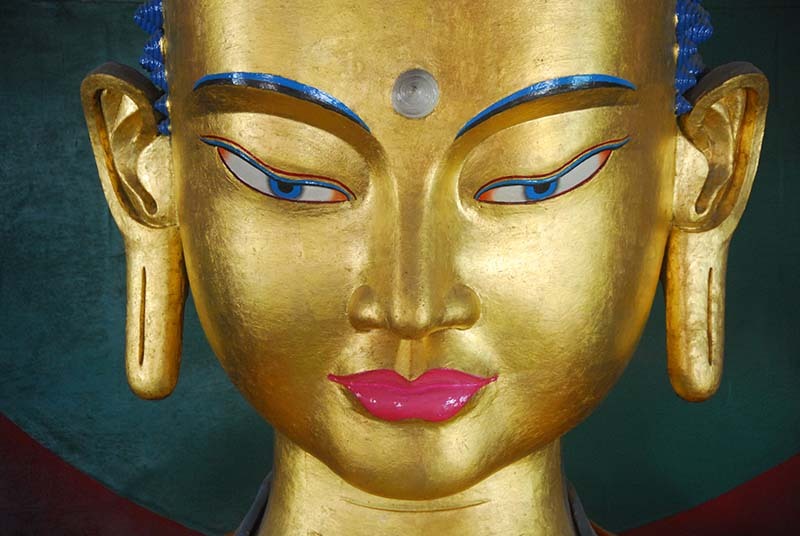 Apart from the shops and hundreds of hotels, there is an old Tibetan Gompa with a beautiful double height Buddha statue and another small monastery where the young monks live. Other than that we are spending our days meeting up with Pippa while she is here, and eating! In the surrounding valley and right down to Kulu there are extensive orchards which produced huge quantities of apples and stone fruit in particular from which they make a very passable fruit wine (we are told). 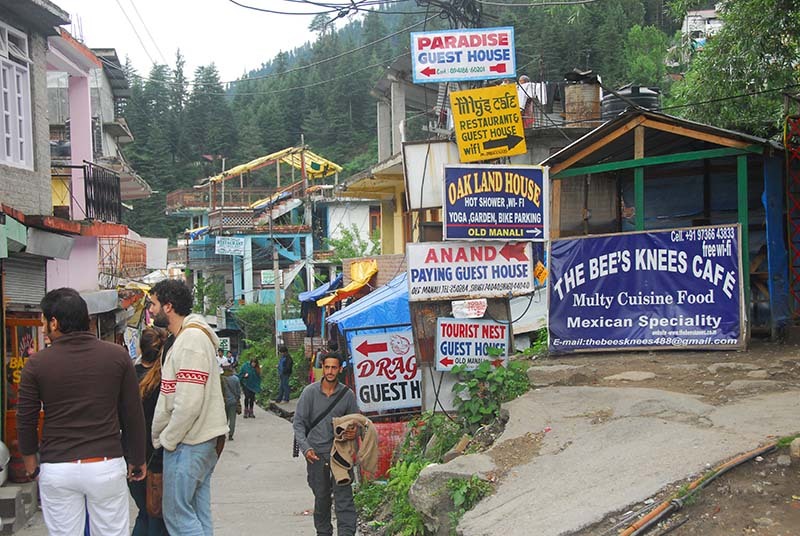 We walk up the road in Old Manali, past the guest houses and cafes going high above the valley until we reach some of the old original houses. We say our farewells to Pippa and Co as they set off to the high altitude deserts of Ladakh. Pippa may go on to London and among other things, catch up with our UK relatives. We originally intended to stay an extra three days in Manali, and so booked into the Apple Bud Cottages for that time (the Silmog Garden was booked out) and so today (in the pouring rain) we decided to walk to this new Hotel, which we are told is 1.5 Km down the main road and 200m up a side road. The road is awash as we start off and soon we are dodging the spray from passing traffic. 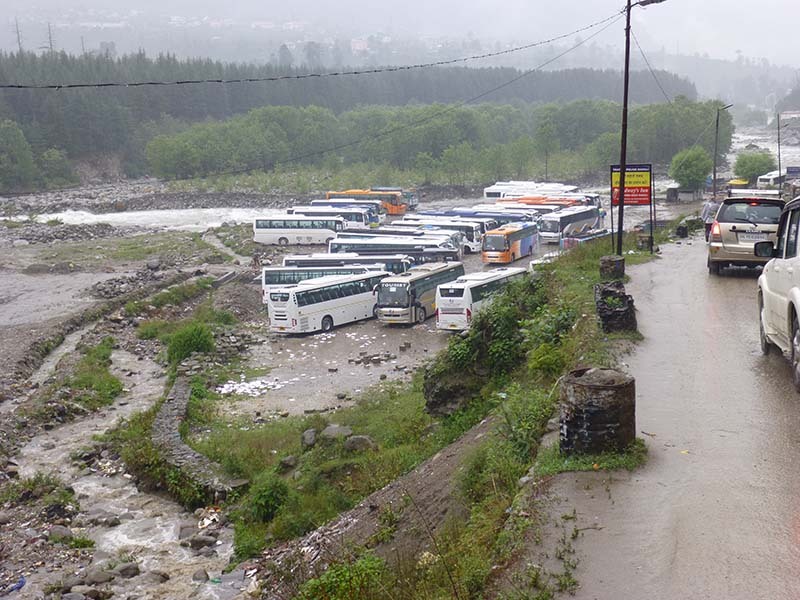 We reach the end of the town where a huge area down by the river is used as a bus park for some of the hundreds of tourist buses that have invaded the valley. On down the road where the punture repair and mechanics shops vie for business and at last to the turning we are looking for. We have found the ABC and getting out of the still pouring rain, eat lunch in the hotel’s restaurant (veg spring rolls – excellent!). We quickly see that this is a very impractical hotel for us. We try and get a taxi back but can’t get one (they won’t do it because of the traffic jam). We walk in the rain to Apple Bud Cottages. 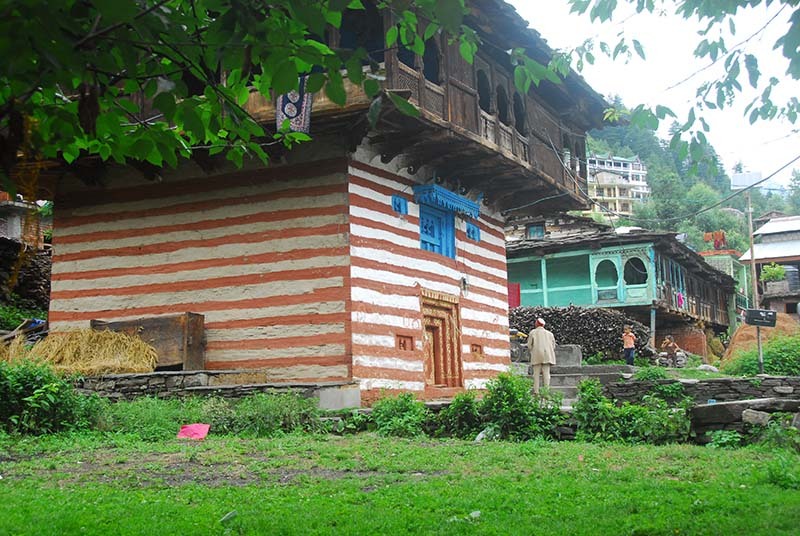 We walk back still in the pouring rain and cancel the booking for the ABC, deciding instead to get out of Manali asap (it feels like that) and try the Naggar Castle Hotel – a six hundred year old castle which is now a hotel, and happily leave Manali behind. 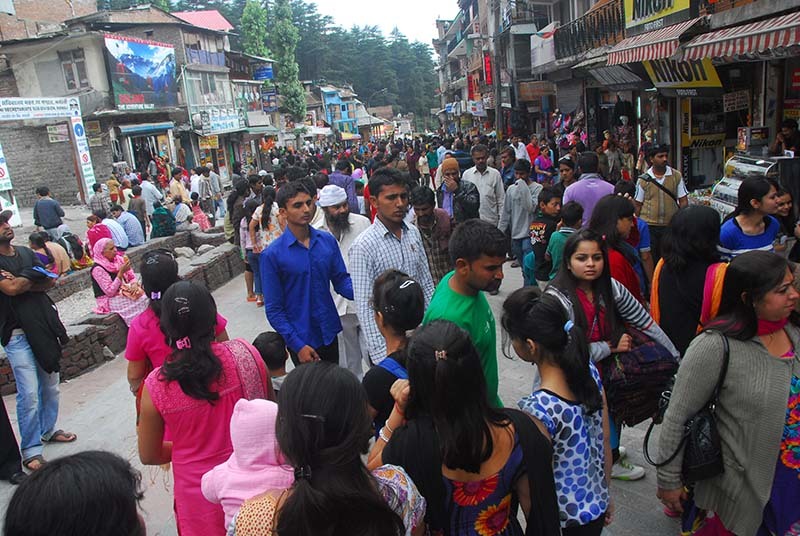 Oh dear, I don’t really see how they are going to avert the spreading chaos of Manali. Another chapter in our journey draws to a close. I hope you enjoyed this telling of it. PS Check out Jacqui’s blog here. PPS There is, of course, another side to Manali, reminding us of the impermanence of all things. 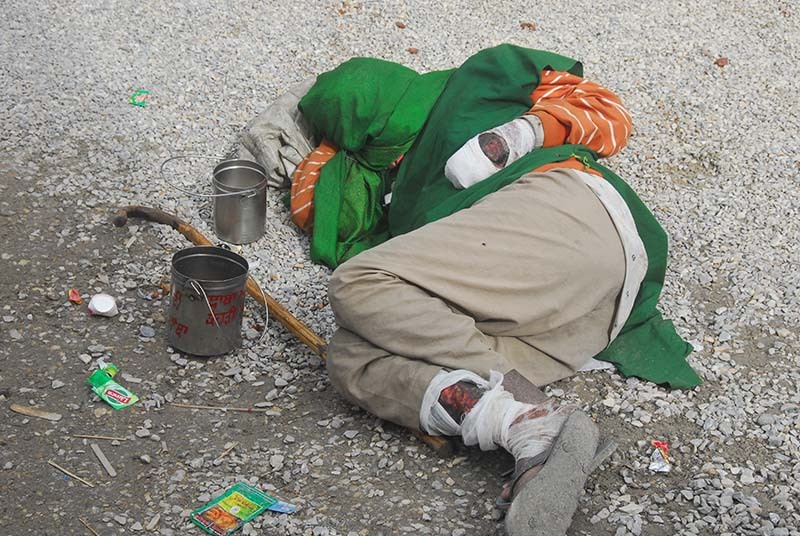 This man lies amid the crowds on the Mall, his suppurating wounds hardly covered by the bandages. He is ignored by most.